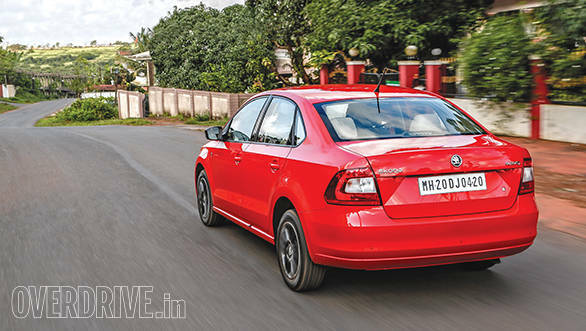 The koda Rapid has always played second fiddle to the Volkswagen Vento, but as far as the updates are concerned, it has been edging ahead of its German sibling. After last year's mild facelift, the new 2015 model already promises more improvements - outside, inside and underneath the skin. Visually the car looks similar to the outgoing model, unless you specify it with the 'black package' that you see on our tester. The package includes the gloss back hood garnish, a matte black grille, black alloy wheels and black accents for the fog-lamp and headlamp housings and the outside rear view mirrors. I have mixed reactions about the black headlights as they tend to look very similar to their tacky aftermarket counterparts, more so on the red car. Probably a smoked finish for the outer glass could have made for better aesthetics. 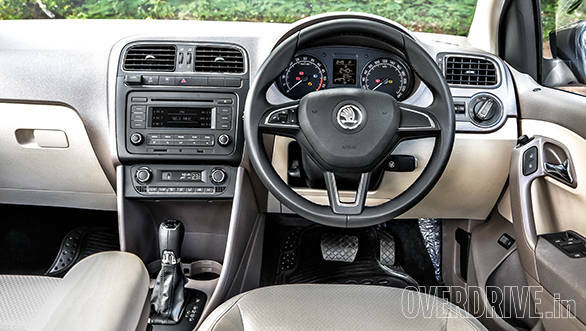 On the inside are the brown and beige interiors that were introduced in last year's model. The plastics feel more premium than most other cars in the segment, including the newcomer, the Ciaz. The stock car doesn't get any touchscreen infotainment or navigation systems, but knowing koda, I expect them to be made available at a dealer level. Speaking of features, the Rapid now gets reversing sensors as a factory fitment. The update also brings in a cruise control system. Its switchgear is mounted on the headlamp stalk, and the controls aren't as intuitive as the rest. 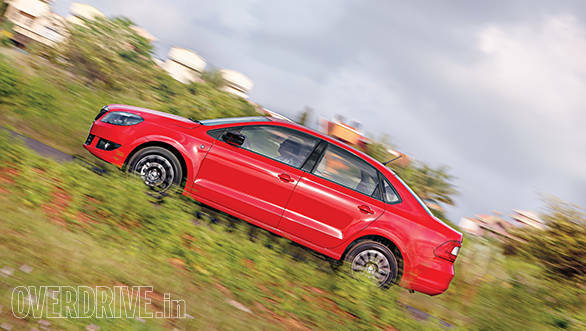 Apart from these additions, the biggest change for the Rapid is under the hood. 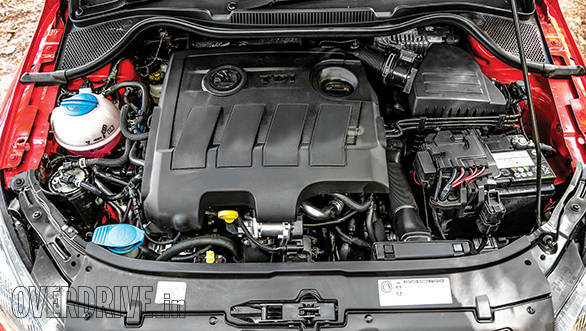 The car now gets Volkswagen's new 1.5-litre common rail turbo-diesel engine that we recently tested on the updated Polo. For the Rapid though, it runs the higher state of tune that extracts 105PS of power at 4,400rpm and 250Nm of torque between 1,500-2,500rpm. Those numbers aren't class leading, but they aren't too small either. The engine is based on the 1.6 TDI engine that it replaces, but you don't feel the deficit in displacement. The mill has a strong mid-range and doesn't demand frequent gear changes. The engine also feels more refined and its inherent gravelly note is quite muted inside the cabin even higher up the rev range. Interestingly, the koda Rapid diesel will come with two gearbox options - a 5-speed manual and a 7-speed dual clutch automatic. 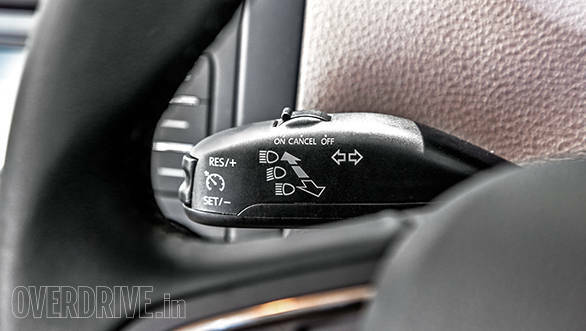 The latter is a big deal because apart from the Verna, there is no other diesel sedan in this segment that offers an automatic transmission and the dual clutch configuration instantly makes it more special. 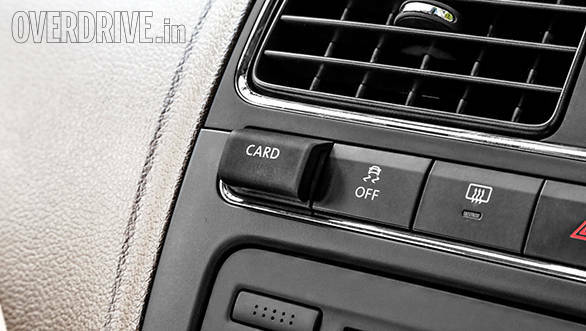 It is a quick gearbox and comes with two driving modes - D and S. The D mode is quick to upshift or downshift at part throttle. When you put your foot down though, it takes a tad longer to respond. The S mode on the other hand makes the throttle response sharper. On part throttle it holds the revs and when you step on the pedal it will accelerate all the way to the redline before shifting into the next gear. But in either of the modes, the initial shove between the 1,200 to 2,000rpm range is quite sharp and can get unnerving and jerky at first. But once you spend time and get used to the throttle modulation, you should be fine. The Rapid diesel is known to have a heavy clutch, so much so that a friend of mine who's a doctor keeps joking that most owners will need a knee replacement surgery before they finish paying off their vehicle loan. The automatic transmission should fix that. Also interesting are the fuel economy figures that the new engine claims. With its manual transmission, it can achieve 21.14kmpl, while the DSG box claims to extract 21.6kmpl. Given the efficiency of the dual clutch transmission, the frugality of the TDI engines and the fact that the automatic variant is almost 20kg lighter than the manual, extracting a higher fuel economy from the auto 'box over the manual transmission sounds achievable. I expect the real world figures to be between 16-18kmpl for either of the gearboxes. koda confirms that there is no major change in the suspension components or the setup. However, the new engine and gearbox have demanded a slight bit of tweaking to accommodate the change in weight. Therefore there isn't a noticeable change in the way the Rapid tackles undulations and imperfections in the road surface. The roads in Goa offered a good mix of both and the car was gliding over them without any problems. However, the relatively stiff setup could offer a choppy ride on sharper joints and rutted surfaces. The high speed stability is quite good and the steering feels well weighted at both highway and city speeds. The Polo's new steering setup felt marginally better and more precise though and I would have loved to have a similar feel even on the new Rapid. But the current setup won't leave any room for complaint and is eons better than the Verna or the Sunny. Speaking of which, out of the European sedans, which feel more solidly built than their Japanese and Korean counterparts, the Rapid has always been the better one to buy. More so now with the new kit. What all of us had been wary of so far though, was koda's service support. But with their after-sales service showing a constant improvement in the past few months, the Rapid puts forward a better case for itself this time around. It will be interesting to see now how the Vento responds to this move.